BRIDGEWATER - The Rose Fund took home more than $12,000 following its first annual dinner and auction May 3. President of the committee and mother of Rosanne Himmelman, Maxine Himmelman, said although Rosanne had metastatic colon cancer, she continued to take care of fellow patients. "There are those that step back and those that step up to the plate. Rosanne chose to step up. She never thought twice to open her heart," said Ms Himmelman. "Before she'd receive her own treatment, she would see to the needs of others, often with words of kindness or small gestures." Rosanne Himmelman became well-known in the community through a series of articles in this newspaper called "Rosanne's Journey." The 12-part series chronicled the 38-year-old woman's struggle with metastatic colon cancer. Rosanne died on February 8, 2005 but emcee Don Downe said her dream is still alive. "The joy is that her dream lives forever," said Mr. Downe about the fund that raises money for cancer patients. "It's a blueprint of what she wanted to have accomplished for our community in the future." Mr. Downe said Rosanne would have loved to have lived to see a cure for cancer. But, he said, she also witnessed her fellow cancer patients struggling financially as a result of diagnosis and treatment. It was during her treatments that she had an idea for a foundation to ease their financial burden. Her idea was to raise money to help with gas, meals and parking when travelling for medical appointments, help patients purchase the many over-the-counter medications needed while on treatment and help pay for groceries or heat if needed. South Shore Health cancer care navigator Crystal Harris knows all too well the financial struggles cancer patients suffer in addition to their illness. She said she hears the word "no" a lot when asking for help on behalf of patients. But, she said, it's reassuring that the Rose Fund always answers "yes" to patient requests. 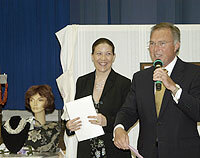 In addition, Mark and Marissa Eisner, of Bridgewater, attended the auction. The couple were a part of the 2008 Family Expo's Big Give and were given $1,000 to give to a charity. Mr. and Ms Eisnerpurchased $500 worth of jewellery from the charitable group, Work for Widows, for the auction. Purchasing the jewellery not only helped the widows impoverished by the 2004 tsunami that hit Sri Lanka, it also helped raise $1,000 for The Rose Fund.